Are you losing the battle to clutter and chaos in your garage? Maybe even the war? Good! Because now is the perfect time to let the professionals at TLC Garage Works, Inc, design and construct the garage of your dreams – clean, uncluttered, functional, safe, just as perfect as these pictures demonstrate. Just think what you could do with 600 more square feet of usable space. You might even want to put the car back inside – just for old time’s sake! Here’s what you get from the professionals at TLC Garage Works, Inc. 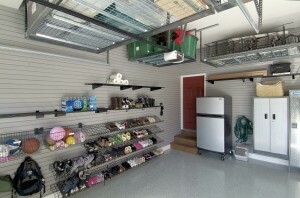 Undertake a complete garage organization make-over of your garage, or just the areas you need. Provide you with the best garage floor, garage shelving, garage cabinets and garage storage organizers for your particular garage needs. Whatever you need, whether it’s a complete garage make-over, or just a new garage floor, better garage storage organization, new garage cabinets or garage shelving, TLC Garage Works, Inc has the right organization solution for you. Don’t wait any longer. There is an easy, turn-key solution waiting for you at Garage Works, Inc. Give us 5 days, and we’ll give you the garage of your dreams. Call today for your free in-home, no-obligation consultation.